Below are course options for our Fall and Spring semesters. Please take care to select the course and level that you wish to enroll in. The Repeater Level is only available for those who have taken the course previously. Includes: 18 Live Webinars with Video & MP3 Recordings. Manual (Digital, 360 pages). Training Videos (Digital, 10 tracks). 5 Bonus Videos. Participant Forum. Membership in Interactive-Visuals eCommunity. 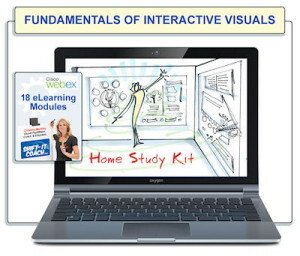 Have you previously attended Fundamentals of Working Visually or purchased the Home Study Kit? The Repeater Option on the online training is now completely FREE. Email admin@shift-it-coach.com to request coupon code to attend as my guest (a perk for my previous students). Includes: 3 Training Days (9am-5pm). Snacks. Manual (Printed, B&W, 360 pages). 2 DVDs. Color Set of Markers. Membership in Interactive-Visuals eCommunity (including monthly drop-in webinar). Includes: The Basic Package PLUS Three Private Coaching Sessions with Christina (45 Minutes Each Via Web Conferencing). Times of live class won’t work for you? Can’t wait until the next live training? FYI, The Fundamentals Home Study Kit is available 24/7. For full explanation of The Kit and instant online ordering, click here. Fees are in Canadian Currency, see www.xe.com for current currency exchange rates. Your credit card company will automatically convert and place on your monthly statement. Canadian residents charged applicable taxes. Payment plans include additional fees. The most economical plans are the one pays. Payment Plans: First payment is immediate, then will automatically bill every 30 days from date of last payment until plan complete. Due to the timing of your registration, payment plans may run beyond the completion of the course. I know this, offer them as a convenience and expect my clients to honour their contractual agreements accordingly. Should you choose not to, know that your account will be turned over to a collections agency which could impact your credit rating for up to 7 years (so please use payment plans only if you have the ability and intent to fulfill them). Refund Policy: Due to immediate access to class materials, there are no refunds given after purchase. In the event that you are not able to attend you may transfer your spot to another class or to the Home Study Kit. Intellectual Property: The materials in this program are for your personal use only to be applied within your own practice. You may not use my I.P. in your own trainings. If you are a coach or other helping professional who would like to use my SHIFT-IT Visual Coaching System with your own clientele, please see VISUAL COACHING CERTIFICATION for application details.